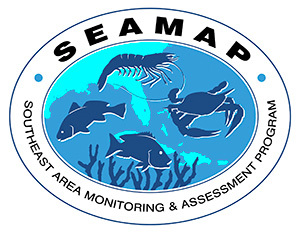 This is the first preliminary data summary for the 2002 SEAMAP Summer Shrimp/Groundfish Survey in the northern Gulf of Mexico. This week's summary includes sampling from June 3 (a.m.) through June 9 (a.m.) by Texas vessels sampling Texas' inshore and offshore waters, by Alabama's A.E. VERRILL, and by Mississippi's TOMMY MUNRO. Catch data from the A.E. VERRILL and TOMMY MUNRO were taken with a 40-ft trawl. Catch data from the Texas vessels were taken with 20-ft trawls. The catch data east of the River indicated that the highest brown shrimp catch rate was 39.0 lb/hr of 67-count shrimp at 30°11.7' N. lat. and 88°17.1' W. long., in 7 fm. The catch data east of the River indicated that the highest white shrimp catch rate was 3.2 lb/hr of 15-count shrimp at 30°13.8' N. lat. and 88°13.1' W. long., in 5 fm. The highest pink shrimp catch rate was 8.4 lb/hr of 27-count shrimp at 29°48.5' N. lat. and 88°44.4' W. long., in 8 fm. The highest finfish catch rate east of the River was 510 lb/hr reported in 35 fm at 29°17.1' W. lat. and 88°34.9' W. long., with Atlantic croaker being the predominant finfish species. The catch data west of the River indicated that the highest brown shrimp catch rate was 14.5 lb/hr of 129-count shrimp at 29°35.4' N. lat. and93°56.9' W. long., in 5 fm. The catch data west of the River indicated that the highest white shrimp catch rate was19.6 lb/hr of 28-count shrimp at 29°40.4' N. lat. and 93°55.5' W. long., in 1 fm. No pink shrimp were caught west of the River during this sampling period. The highest finfish catch rate west of the River was 115 lb/hr reported in 5 fm at 29°35.4' N. lat. and93°56.9' W. long., with Atlantic croaker being the predominant finfish species. Catches of brown shrimp off Texas were highest off Matagorda Bay with the highest catch rate being 17.1 lb/hr of 107-count shrimp in 5 fm at 29°15.8' N. lat. and 94°46.4' W. long. The highest catch rates for white shrimp were 21.0 lb/hr of 20-count shrimp at the same location. No pink shrimp were caught off Texas during this sampling period. The maximum finfish catch rate was 179 lb/hr in 5 fm at 29°15.8' N. lat. and 94°46.4' W. long., with spot being the predominant finfish species.